Assembled Dimensions: 15 ft X 15 ft X 9.5 ft. Plenty of room for backyard jumping fun with the Skywalker Trampolines NEW 15 ft. 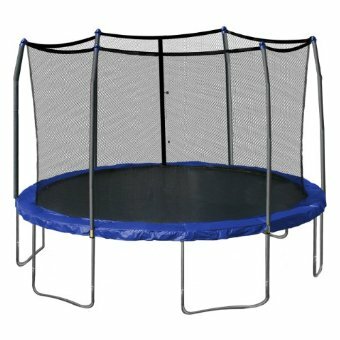 Round Trampoline and Enclosure. This 15 ft. Trampoline and enclosure combo will keep your children both entertained and active. The trampoline and enclosure features a frame assembly that uses heavy gauged rust resistant galvanized steel using T-sockets at each trampoline and enclosure joint to create a secure and uni-bodied frame. The unique Stay-Put enclosure uses a gap free design attaching the enclosure netting directly to the jump mat v-rings using a 'button-hole' feature with no ropes to thread. All materials are made with durable UV protected material for increased weather resistance. Store: Precious Heaven Scent Condition: Brand New Price: $269.95 Total Price: $269.95 Buy It from Precious Heaven Scent No returns. 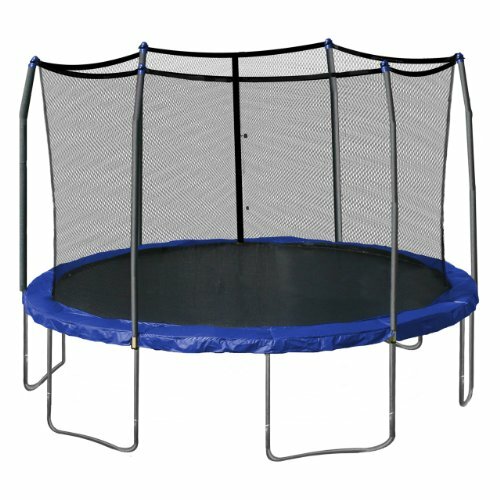 Skywalker 15 Foot Round Trampoline and Woven Enclosure with Spring Pad, Blue -- Free 1-3 Day Delivery With Hassle-free, 30-day Returns! Last updated: April 18, 2019 at 12:08 EST. Pricing information is provided by the listed merchants. GoSale.com is not responsible for the accuracy of pricing information, product information or the images provided. Product prices and availability is subject to change. Any price and availability information displayed on amazon.com or other merchants at the time of purchase will apply to the purchase of the product. As always, be sure to visit the merchant's site to review and verify product information, price, and shipping costs. GoSale.com is not responsible for the content and opinions contained in customer submitted reviews.